The federal government is contributing over $10 million to the the construction of a new dedicated nuclear medicine building on the TRIUMF research facility campus, the Institute for Advanced Medical Isotopes (IAMI). 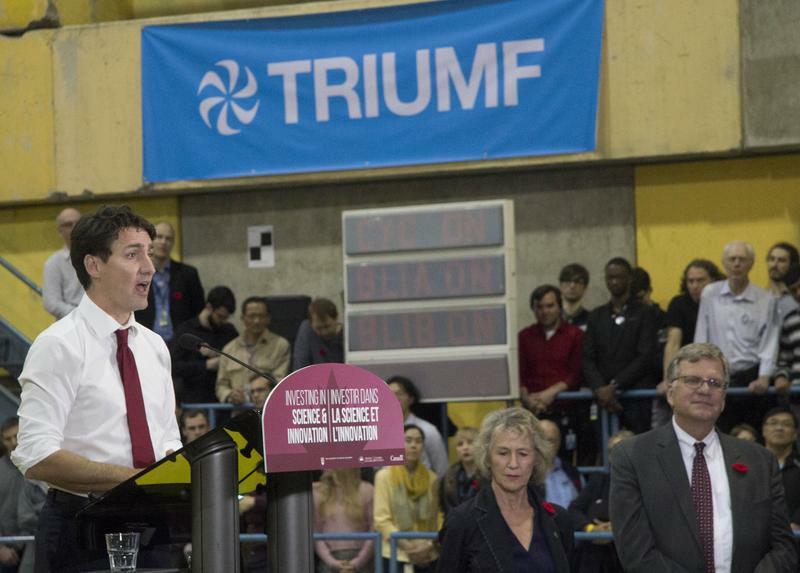 Prime Minister Justin Trudeau announced this support earlier today during his visit to TRIUMF. Located just south of Wesbrook Village, TRIUMF is Canada’s particle accelerator centre, conducting a wide variety of research on the different uses of radioactive isotopes — variants of different elements — in medicine. In addition to federal funding, the province of British Columbia has contributed over $12 million, TRIUMF is contributing over $5 million and both BC Cancer and UBC are contributing $2 million, bringing the total funds allocated to the project to over $30 million. “The new Institute for Advanced Medical Isotopes will unite world-leading experts across industry, academia and government,” said Trudeau. The new facility will expand on the existing TRIUMF research into nuclear medicine in several important ways, featuring on-site facilities that will allow it to produce several valuable medical isotopes. These include Technetium-99m (TC-99m), which is an integral component of many common diagnostic tests for diseases like cancer. Ensuring a steady supply of this isotope became a particularly pressing issue with the March 2018 shutdown of the Chalk River reactor, which produced about a third of the world’s TC-99m. Besides TC-99m, the IAMI will also feature production facilities for radiotracers that are commonly used in positron emission topography (PET) scans. These tracers are created using specific isotopes that are only radioactive for a brief period of time. Once these radiotracers are in the body, they react with other particles, giving off an energy signature that is picked up by specialized scanners and used to create an image of internal structures. When combined with other imaging techniques, PET scans can give healthcare providers a much more complete picture of what is going on with a patient. These scans and the radiotracers they rely on are also useful in the drug development process, as they allow researchers to track the flow of drugs through the body and see which specific body systems they affect. The expanded isotope production at the IAMI will be made possible partly through the use of a new TR-24 cyclotron, one of the most advanced particle accelerators in the world for producing medical isotopes. Beyond isotope production facilities, the IAMI will also serve as a hub for research into new cancer therapies, building on existing TRIUMF work in nuclear medicine like a proton therapy that targets difficult-to-treat tumours that occur at the back of the eye. “Together, we will develop leading edge, highly-targeted cancer therapies, with access to the rarest and most advanced isotopes available,” said Dr. François Bénard, VP research at BC Cancer. The federal government has high expectations for the eventual impact of the new institute, citing a hope for the generation of new employment and education opportunities in addition to new research and discoveries. “On top of the many direct medical benefits Canadians will receive through better research and science, the innovation that will happen here will create good jobs, spark entrepreneurship and provide an incredible training ground for the leaders of today and tomorrow,” said Trudeau.